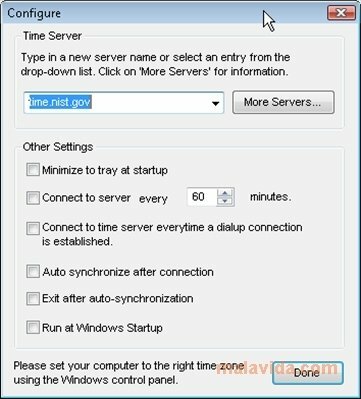 Time Synchronizer allows us to keep our computer's clock always on time thanks to its automatic adjustment. The application is capable of accessing a public time server based on atomic clock systems. This program is capable of connecting automatically to an online time server provided that the user has a connection. It connects at regular intervals which, added to the vast precision of this kind of device, makes Time Synchronizer a perfect application. Furthermore, the software starts automatically together with the Windows boot process. Time Synchronizer is capable of synchronizing the system's internal clock and can be configured to turn off after the synchronization. You have access to a large amount of servers from which you can synchronize the application and it's also possible to determine the frequency of the connection. Its adjustable configuration options add greater interest to the software. Don't lose your rhythm nor your time and download this application right now.